Home » Food and Nutrition » Is There Really Such a Thing as Good Carbs? Is There Really Such a Thing as Good Carbs? When talking to dieters, listening to talking heads on television, or reading up on the latest celebrity diet trends, one thing seems apparent: carbs are bad. “Carbohydrates” is practically a swear word in these circles that recommend cutting out wheat, gluten—almost any form of carbohydrates, really. Unless you suffer from celiac disease or a diagnosed gluten sensitivity, cutting out carbohydrates altogether will do you little good. In fact, it could cause harm to your metabolic system and leave your body short on a number of beneficial and essential vitamins and minerals. Not all carbohydrates are created equal, much like all calories are not held in the same standing. Whole grains, for example, are a great source of quality nutrition that can lower cholesterol, reduce your risk of diabetes, improve digestion, and promote overall health. Whole grains are unrefined carbohydrates that feature all the parts of an original wheat kernel. They feature bran, germ, and endosperm that provide added nutrition, increased fiber content, and a number of vitamins and minerals naturally found in the soil that are essential to a healthy, well-functioning body, while maintaining a low glycemic index. Refined grains, on the other hand, are largely stripped of nutrition and are little more than sugar, which is very high on the glycemic index. The glycemic index scale (GI) is used to track sugar response, and high-GI foods can increase your risk of developing type 2 diabetes. These are the carbs you should stay away from. One of the biggest health benefits of whole grains is high fiber content. Certain whole grains, like oats, barley, and bulgur, feature high levels of fiber that serve as a great helping of dietary fiber. As an adult, you’re required to get between 25 g and 30 g of fiber per day. The benefits of this amount—or more—include a lower risk for diabetes, lower LDL (“bad”) cholesterol, improved microbiome function, and better digestion. Whole grains offer both soluble and insoluble fiber and in a much higher amount than a refined grain. For example, two slices of dark rye bread contain a total of 8.5 g of fiber; meanwhile, you’d get less than two grams of fiber from two pieces of white toast. Whole grains also work to keep your bowel movements regular. 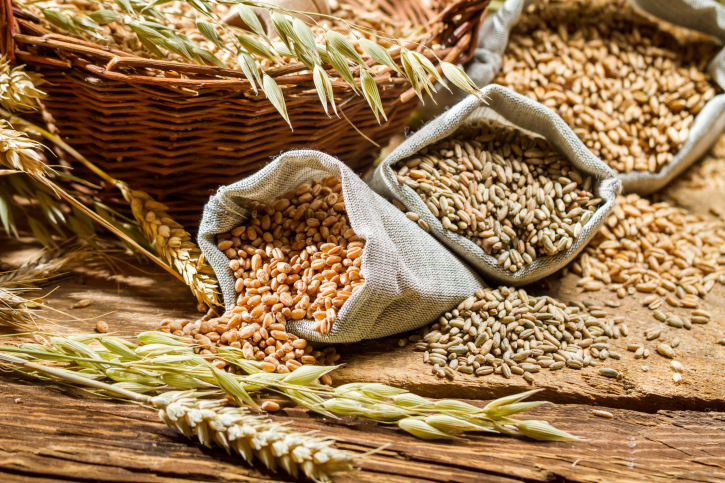 By promoting diversity and the growth of “good” bacteria in the gut, whole grains improve nutrient absorption and your body’s ability to hold on to what it needs and to get rid of what it doesn’t. An array of healthy gut bacteria also helps improve your immune system, which can aid in your body’s recognition of and defense against infection. Keeping bowel movements regular and having “good” bacteria in the gut also protect you from experiencing digestive pain. One of the conditions it prevents is diverticulosis, which is when little pouches form in the colon causing inflammation, constipation, diarrhea, and pain. One of the biggest benefits to whole grains, however, is how they affect your heart. They lower bad cholesterol and total cholesterol, making it easier for blood to pass through your arteries. This lowers your risk of hypertension. Furthermore, whole grains help lower triglycerides in your bloodstream. Triglycerides are a contributor to heart disease, so increasing your intake of whole grains can help prevent (or at least lower) your risk of heart-related illness. One caveat to leave you with: you must be careful when you’re purchasing whole grains because marketers can be deceptive. For example, whole grains are typically brown, so some companies dye their food using brown sugar or molasses. The Whole Grains Council certifies all whole grain products by approving the addition of its stamp on the package, so look for it when choosing what to buy. Gardner, A., “18 Health Benefits of Whole Grains,” The Huffington Post web site, August 10, 2014; http://www.huffingtonpost.com/2014/08/10/whole-grains-health-benefits_n_5655022.html.